At the same time, in the local park (Gradski Park), a local (?) group was playing some traditional (?) music. I took a short video of that too. Well, we are getting a chance to travel to Greece! We are leaving today and will be gone all of this week. I don’t know if we’ll have internet access while we are gone. If we do, I’ll do my best to blog over the week. If not, I’ll do one of my delayed blog things again. [Update 07-08-2008 09:44:12] Added the links to an article I wrote about things I wish I had known. Saying Cyndi and I like to read is an understatement. About 25% of our space and weight moving to Europe was spent on books. And we still only have a few. How to get more? Today, I stumbled on this service called book mooch that is an online book sharing service. Have extra books you don’t mind sharing with others? Want a book someone else has? Bookmooch will let you do both of those. It doesn’t cost anything to sign up so I did. After a few weeks, I’ll let you know how it works. [Update 2012-12-30 07:23:35] Nothing much ever happened with this in Serbia. However, since returning to England, I’ve sent several books out. Read more on this blog post. Just a note to everyone out there who might be thinking the same thing I was: you can’t put hot chocolate mix in your jezva, heat the water, add coffee, and expect to have a moca serbian coffee. Well, I better explain. I like coffee. American drip coffee is just ok (but it has to be strong). I don’t like paying Starbucks $5 for a medium moca (yes, I refuse to call it a vente…or whatever it is they call it). But I do because it is good. I could make a substitute by taking hot chocolate mix and adding it to drip coffee. It made for a good treat in the afternoons at work. In Serbia, I missed the moca. No problem I thought….they have hot chocolate and they have coffee. 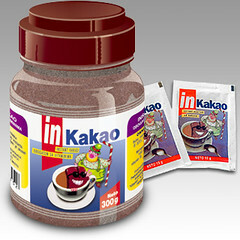 Yesterday, I bought me some In Kakao powder at the store (it was in the chocolate section with other hot chocolate mixes). It looked like hot chocolate and was cheap (90 din). This morning I took my jezva and started to make my moca. I added the powder at the beginning thinking that it wouldn’t mix right after I added the coffee. Well, everything went well (except for having to add more because it didn’t taste chocolatey enough when I tasted it). I added the coffee, poured it into my cup, waited a few minutes, and took a drink. Well, it was awful! The grounds hadn’t settled yet. No problem…I just needed to wait more. After waiting and tasting every few minutes, the grounds never settled. So, the chocolate must mess with the properties of the water and the grounds never settle. ARG! So, I’m going to try to make it again but do it differently. I’ll let everyone know what happens. I’m Glad this wasn’t Us! I came across this story on one of the blogs I read regularly. It is The Consumerist and focuses on consumer issues. The story deals with these people who were moving but the truck driver drove under a bridge that was too low. He totally tore up his truck and damaged their stuff in the process. I’m looking for a way to make my copy of Logos set up a chronological bible reading plan (you know…where you read the Bible in the order that everything happened). Does anyone have any ideas? Wow…the past month has been simply amazing. We were able to travel to Belgrade to see some old friends and meet some new ones. Cyndi and I had met a lady, her husband (њен мзж), and their daughter (ваш кћерка) in Richmond. 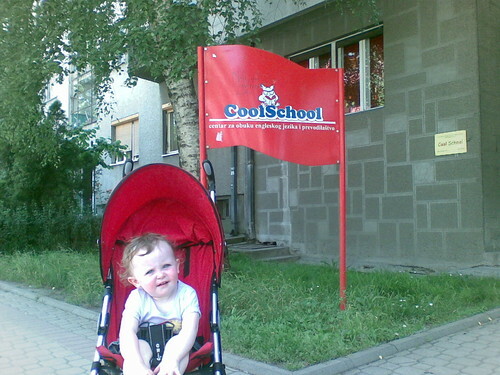 Her and her daughter are in Serbia for the summer and invited us to Belgrade to visit. While there, we met her parents, her brother, and his girlfriend. On the bus ride back, we met a guy from a town near here whose mom teaches english. We are going to try to call her and arrange a visit sometime this month. In addition, we have spent the last month in language training. Wow…that is way way harder than I ever thought it would be. But there are some cool things about the language as well. Instead of saying “I am drinking water” you can just conguate the verb drink (пити) to mean I am drink (пијем) and add the noun for water. So you can simply say пијем вода. Pretty cool. But then you have several cases to deal with: Lokative (used when you want to tell someone where you are) and others with other uses. Keep up on our blog because I plan a series of posts about that very thing. The easiset way to do that is to subscribe to our rss feed using your favorite reader. Before we left the states, we had some friends give us some money and I told them I would buy a bike with it. Well, I did and was very excited; however, late last week, some low-life stole my bike seat Arg. I just went to the bike store today to try to get a new one. I tried to tell the guy that I wanted the same seat that was on it (it was comfortable). He took my number and his boss is going to call either this afternoon (постле подне) or tomorrow (сутра). We’ll see what happens. 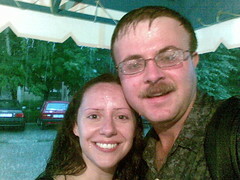 One humourous story….On our way home from language class on Friday, we got caught in the rain Read more about it in this post. We thought about calling a cab, but decided not to. By the time we changed our minds, we were within 2 blocks of home. Speaking of rain, it has rained quite a bit here. This post has a video of a frog-choker of a rain storm. We got gutsy and took out our bike trailer a few weeks ago for the first time. I’m sure we were the talk of the town, but it made for a good way to get Lydia around. It also makes going to the store way eaiser (and we don’t have to borrow a car). We can just put everything in the trailer and go. In the next month, I’ll probably try to take Lydia on a longer ride with me to let her see the countryside….we’ll see how that works. The Serbs have their own version of coffee. They don’t drink drip coffee of espresso (not normally). They drink Turkish Serb coffee. Want to learn how to make it yourself? Go read this post. Want a pot? Let me know and I will send you one and some coffee. I like it! A lot! While you are thinking about us, remember to pray that we would continue to meet people. We are looking for ways to be involved in people’s lives. We have met several people and are working on several other things that may pan out. I already have a friendship with 2 people in town. Keep those friends in your prayers. Also pray for our families back home. My parents are getting ready to move overseas and Cyndi’s parents are in Proctorville. Our vonage phone was down for about one week so that made it hard to keep up with everyone. Also pray for Serbia. There are some protests scheduled in Belgrade next week. As if I didn’t need any more inspiration to learn Serbian. Now, if I do, I can follow what the Japaneese are saying in Shogun!